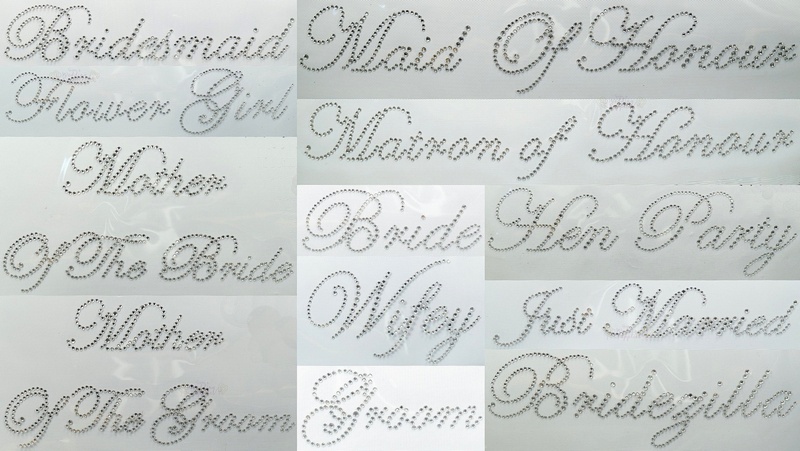 Wedding iron on rhinestones turn your clothing items into something special and show everyone that you are the bride. Use our sparkling bling iron on rhinestone transfers on any piece of clothing such as tshirts, singlets, underwear, dressing gowns, swimwear and even other items such as bags. The iron on transfers are perfect not only for the bride and groom, but also the other bridal party members such as Mother of the Bride and bridesmaids. They make a dazzling favour for your bridesmaids, and look great worn out on your Hen's Night party celebrations. 1) Remove protective plastic backing from the transfer. 2) Place transfer motif on fabric. Place a light cloth (e.g. hanky) over the motif if desired. 3) Iron over the top. 4) After applying the rhinestone applique once, remove the sticky film and discard. 5) Reapply the iron as per step 2.